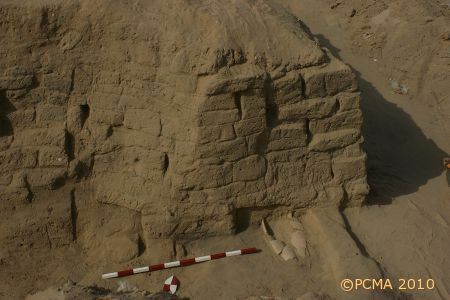 The program for the season had anticipated continued excavations of trenches explored in 2008, that is, Area 1, on the northern defense wall of the Ramesside fortress, and Area 2 where domestic architecture from the Third Intermediate Period had been documented in the previous season. This plan was soon disrupted by news of a new construction project involving the second lane of the road that runs through the site. 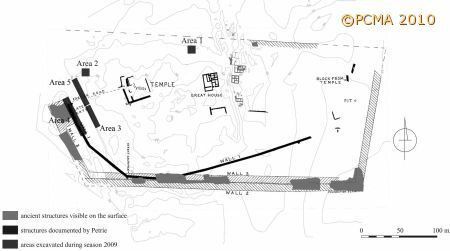 In view of imminent damages to the ancient substance, the mission immediately undertook salvage work in Areas 3, 4 and 5 along the planned road in lieu of the regular excavations [Fig. 1]. 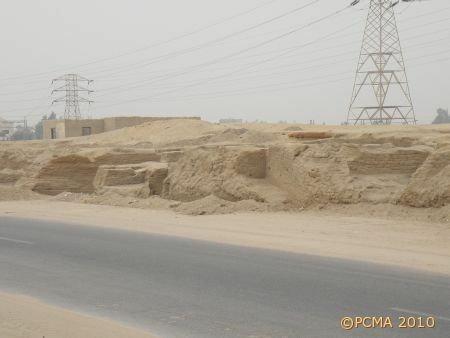 Mud-brick walls approximately two meters high had been observed already in 2000 when the cut for the existing road was made through the site [Fig. 2]. 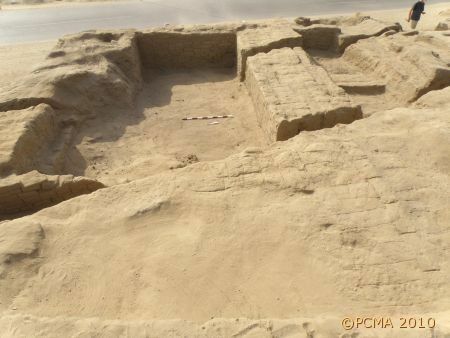 The salvage excavations undertaken by the mission concentrated on clearing and documenting these remains which are threatened by the new road-extension project. The investigations were divided into two areas, designated as 3 and 5, separated by a narrow baulk. The walls in Area 3 proved to be part of a group of buildings attributable to a number of chronological phases: the youngest from the Late Period, the oldest from the Third Intermediate Period. 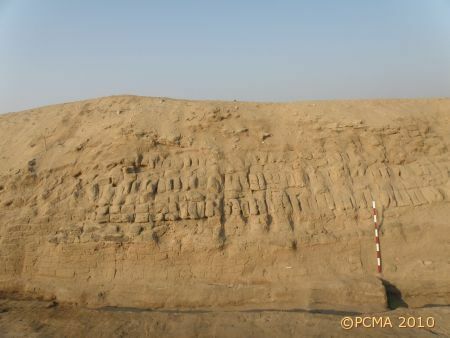 Testing in one spot between standing walls brought to light strata from the first half of the New Kingdom. The Late Period remains are rather poorly preserved, but characteristic because of the dark brown and very porous bricks (called “bubble gum bricks” in archaeological patter) that were used in the construction. The walls were quite massive (approx. 1 m thick) but hardly ever more than one or two courses of bricks high (the highest parts did not exceed 0.50 m). The layout of the structure or structures could not be reconstructed. The underlying architecture, attributed to the Third Intermediate Period, presented a different picture. Here the walls were preserved to a height of even 1.50 m. Walls approximately 1 m thick [Fig. 3] formed an apparently windowless and doorless unit, which revealed evidence of prolonged occupation on a number of consecutive floor levels. It was approximately 4 by 5 m big and was renovated on repeated occasions. It must have been a basement accessed from an upper floor. 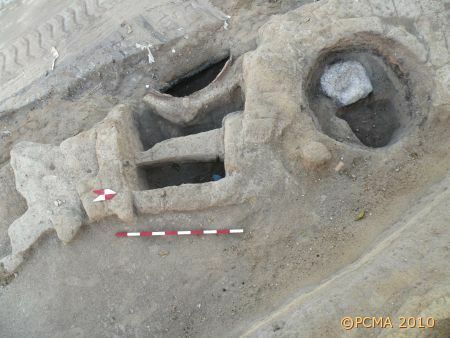 A fireplace and three big storage jars were discovered in strata belonging to a later occupational sub-phase (still in the Third Intermediate Period) [Fig. 4]. Two of these jars contained fish bones and fish scales, osteological remains that have proved to be generally frequent in the relevant layers at Tell el-Retaba. 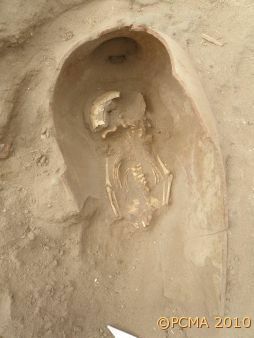 It demonstrates the role played by fish in the diet of the people who inhabited the excavated houses. To the north of the extant domestic architecture described above is an open area about 5 m wide with no observable building activity from the Third Intermediate Period. It has been interpreted as an E-W road running apparently in line with the axis of the migdol, which may have already gone out of use by the Third Intermediate Period. This presumed tract appears to have been functional from the late New Kingdom. It overlies structures that are stratigraphically contemporary with the lowest strata excavated in Area 4 (see below), below Petrie’s wall no. 1, thus surely older than the migdol and attributed to the first half of the New Kingdom. The remains comprise a N-S wall, approx. 0.60 m thick, raised of bricks that are like the characteristic, greenish-colored mud bricks in the walls beneath Petrie’s wall no. 1 in Area 4 [Fig. 5]. A similar wall noted in Area 5 (located north of Area 3) appears to be a continuation of this wall; if so, it would run for at least 10 m.
Underlying this wall was a complex of very thin walls (no more than approx. 0.20 m thick, that is, one row of bricks) [cf. Fig. 5]. Whatever its function – it remains obscure for the moment – it does not seem to have been domestic. This structure stood on a thick deposit of drifted sand. Excavations were interrupted at a level approximately 4.50 m below the modern surface, on a dark-colored silty layer richly mixed with potsherds. The walls discovered in Area 5, located just north of the presumed ancient road recorded in Area 3, are generally in worse condition than their counterparts in Area 3. They are significantly different from the described structures in Area 3 in that they are usually no more than approx. 0.30 m thick, that is, the width of a single row of bricks. Three ovens and a large round silo (approx. 2.50 m in diameter) discovered in this area [Fig. 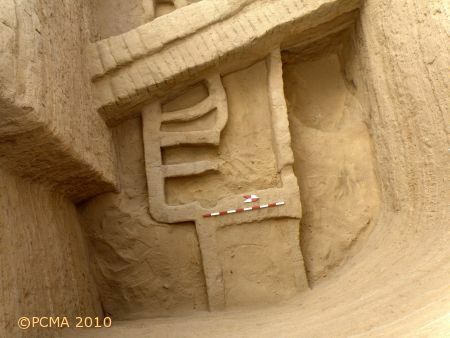 6] are unparalleled in the Third Intermediate Period architectural complex investigated further to the south in Area 3. A provisional interpretation of the investigated remains suggests that the architecture in Area 3 served domestic purposes and comprised houses of significant size, of which at least some had more than one floor. The area that extended to the north of the presumed E-W road had an “industrial” character of some kind. 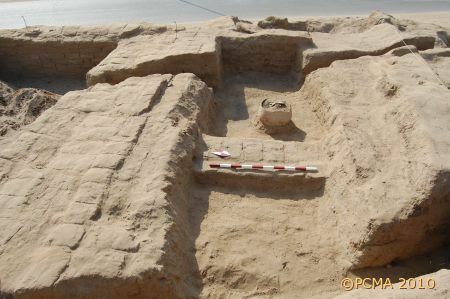 Ovens and silos of late New Kingdom date have been noted in the northern part of the fortress, in Area 1 of our excavations and in the trenches dug in the 1980s and 1990s by Egyptian missions. However, caution is recommended with regard to these observations, as the excavations so far have been quite limited and no buildings of a domestic nature, apart from Petrie’s Great House, have been explored from the New Kingdom fortress. Clearing of a defense wall designated as “Wall no. 1” by W.M.F. Petrie revealed a whole sequence of walls instead of one [Fig. 7]. Along and beneath this wall child burials in amphorae were discovered [Figs 8, 9]. The vessels are from the times of Ramesses II, thus providing a secure New Kingdom dating for the defense wall. In consequence, Petrie’s dating to “after the VIth dynasty” is no longer to be upheld. Two round granaries uncovered in the lowest strata can be dated tentatively to the Eighteenth Dynasty.